Soundtrack and HD wallpaper included. The latest official patch is v1.36. It can be found in the Age of Wonders Heaven fansite (only needed for retail versions). Most mods are found in the AoW Heaven fansite. DevEdit, the tool for customizing the game, is available also at the AoW Heaven fansite, and also make sure to read the beginner's guide if you want to start modding. The most popular rule-set in Age of Wonders which is a basis to many other rule-sets. For 64-bit systems: download this mod fix if you want it to work on your configurations (works with GOG.com, doesn't work with Steam). Includes a lot of popular mods and maps, including Warlock and various full campaigns. Open the Age of Wonders Launcher. Check the box labeled "Skip Intro". 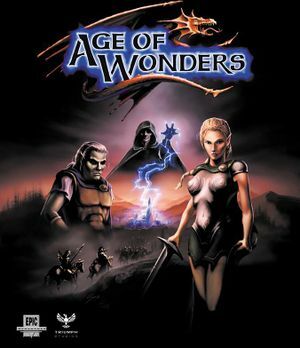 Open "Age of Wonders" and then click on "General". 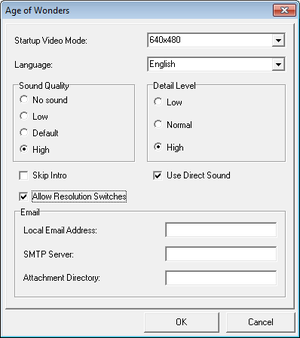 Right-click on "Skip Intro" and choose "Modify". In-game menu can be found by clicking the dragon icon in the lower-left corner. Unscalable UI. Small icons at higher resolutions. Fully supported in Windowed mode. Resolution is changed by dragging window borders or maximizing. Play-by-Email is an another form of online play which basically works by e-mailing the turns. The advantage to it is that you can post turns at any time while the disadvantage is the slowness of the games. Age of Wonders Email Wrapper is almost a required way to play the game by E-mail. It automates the sending and receiving process to eliminate mistakes made by manual e-mail sending. If you don't want to play through the wrapper, be sure to check this guide on AoW Heaven forums. If you haven't found an issue, even if you haven't downloaded from GOG.com, read GOG.com Support Page for more information. Make a shortcut to AoW.exe instead of Launcher.exe. Start playing and press Ctrl+⇧ Shift+C. You will hear a ringing sound to confirm it. Reinstall the game or lower the resolution. Sometimes, the retail game won't work on Windows 7. To fix this, run the game in windowed and if you want to play fullscreen, you can get it to run on Borderless fullscreen windowed. The game also supports external singleplayer and multiplayer maps. Map editor is included in the game. ↑ 1.0 1.1 File/folder structure within this directory reflects the path(s) listed for Windows and/or Steam game data (use Wine regedit to access Windows registry paths). Games with Steam Cloud support may store data in ~/.steam/steam/userdata/<user-id>/61500/ in addition to or instead of this directory. The app ID (61500) may differ in some cases. Treat backslashes as forward slashes. See the glossary page for details.